Makaylah Hampton, 11, puts up a foul shot during the Elks Hoop Shoot Saturday morning at Sandrock Elementary. Hampton hit 15 of 25 free throws to win the contest for her age group in Craig. She will have an opportunity to travel to Glenwood Springs for the district competition. 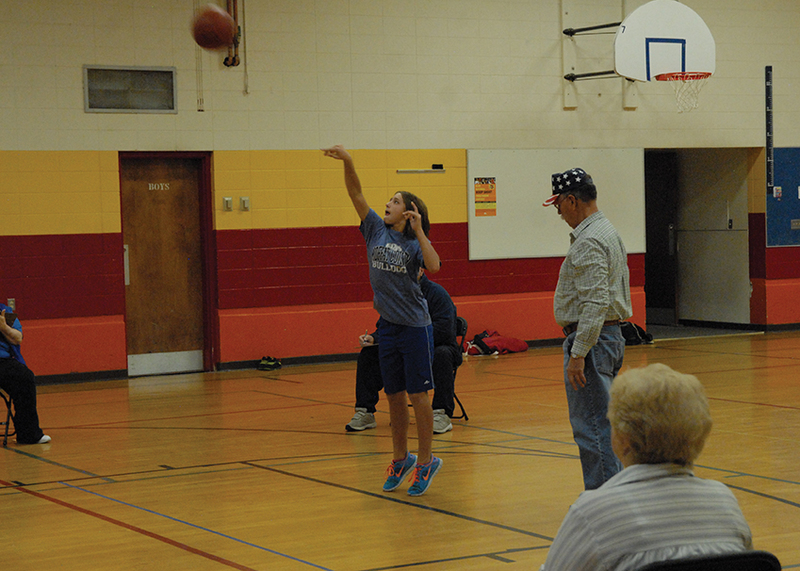 At the Elks Hoop Shoot in Craig on Saturday, shooting free throws was the task, but many different methods of doing it were shown off. Some children attending the event jumped when they shot, while others kept their feet planted on the ground. Some shot quickly, while others took their time with a few dribbles or flips of the ball in between. Most stuck with a traditional over-hand shot, but some put theirs up granny-style. And although the differing styles did result in some children making more shots than others and winning their age groups, Director Frank Sadvar thought everyone walked away a winner, including himself. The Elks Hoop Shoot is a national foul-shooting competition that starts at the local level for children ages 8 to 13. The Elks Lodge in Craig has hosted a Hoop Shoot at Sandrock for years, paying the way for district qualifiers and beyond to show off their free throw capabilities. The Hoop Shoot on Saturday gave Sadvar reason to smile. More children turned out than in years past and participated in the quiet, competitive event with sportsman quality. Six divisions (8- to 9-, 10- to 11- and 12 to 13-year-olds for boys and girls) made up of 27 kids from Craig shot 25 free throws Saturday morning, first in a round of 10, then 15. The top qualifier in each age group will have the option of attending the district Hoop Shoot in Glenwood Springs. If a shooter keeps winning, they may attend the state contest in Denver and then go the National Basketball Hall of Fame in Denver. While he didn’t win his division, Thayne Kitchen, 9, was happy with the runner-up trophy he got to take home. Kitchen said he hadn’t practiced much but his 12 makes were something to be proud of. “I didn’t shoot much before, but I got second place,” Kitchen said. Sadvar stressed to each participant that coming and competing, regardless of how well they shot, proved they had won. He believes having competition at a young age will help them all in the future.